Sick of seeing the scratches and scuffs your office chair leaves on your favorite floor? Tired of the constant scraping noise when moving the task chair? All manufacturers of office and computer chairs today equip them with cheap black plastic wheels. Over time, these will scratch your floors more and more. Sure, you can try floor plastic mats - but they can\'t save your floors from damage. Small dust particles will fall between the floor and the mat - and still leave your expensive flooring scuffed. Try Roller blade Style 3-inch Caster Wheels pack! Simply replace your old low quality plastic casters with Seddox wheels - they\'re durable and safe for all floors especially wooden. Soft noiseless casters - made from high quality transparent polyurethane – will reliably protect all kinds of floor, including wood and hardwood flooring, laminate, vinyl and tile flooring. The Precision Ball Bearings built into the construction of the wheel and frame will ensure velvet-smooth and noiseless chair movement. UNIVERSAL STEM SIZE - 7/16" (11mm) x 7/8" (22mm)- fits all office work chairs sold in the USA with 11mm stems - such as Herman Miller, Aeron, Hon, and more. RELIABLE CONSTRUCTION - frame, stem and wheel axle all made of high-grade steel. The casters are made of durable hard plastic with a shell of top-quality transparent polyurethane. 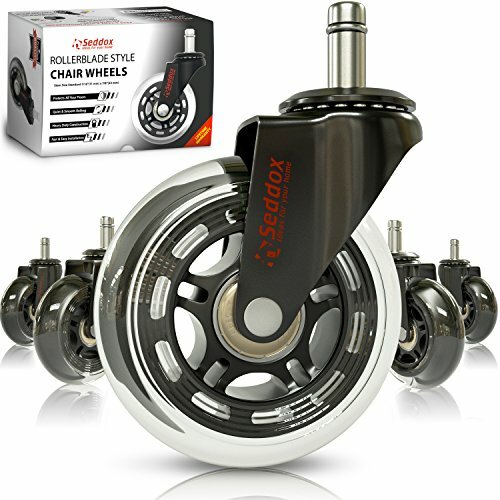 EASY INSTALLATION – Just pull off the old casters from the chair base, with no need for any tools - and push the stem of your new Seddox chair wheels into the socket, until the stem is firmly anchored. ✅ HONEST BRAND - 100% SATISFACTION. We will return your money upon your request if you won't like our pads or they were not what you were looking for. you can order our premium heavy duty office chair casters right now - with NO RISK at all! If you have any questions about this product by Seddox Ideas for Your Home, contact us by completing and submitting the form below. If you are looking for a specif part number, please include it with your message.